The iTaste MVP 3.0 is the newest mod in the iTaste Mod family. 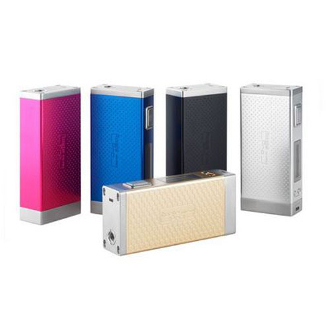 It is a variable voltage mod that has a wider range of voltage settings. It also has variable wattage, has advanced safety features and can be charged while you're vaping. Another awesome feature is that it has the capacity to charge other electronics such as tablets and cellphones via a usb port. This truly makes it a multi-functioning marvel. The iTaste MVP 3.0 has a 510 connection that is flush and has a spring-loaded positive pin. It also comes with an eGo adaptor that allows the use of all eGo 510 threaded clearomizers and atomizers. It also comes with an integrated micro-USB charging cable. BATTERY LEVEL INDICATOR: The iTaste MVP 3.0 has an LED on the top that will cycle through 3 colors depending on the level of battery life. Green = full charge/Yellow = half charge/Red = low charge. LOW VOLTAGE WARNING: The red LED light will flash continuously when the battery level is below 3.3v and the iTASTE MVP 3.0 will automatically power off. SHORT CIRCUIT/ATOMIZER PROTECTION: This feature will protect the iTaste MVP 3.0 from atomizers shorting out and will stop the battery from functioning in unsafe conditions. VAPE WHILE CHARGING: The iTaste MVP 3.0 can be vaped while it is plugged into its micro USB cable. VOLTAGES AND WATTAGES: The range of the variable voltage feature is 3.0v-9.0v that is adjustable in 0.2v increments. It is also variable wattage. The wattage range is 6.0-30.0 watts that is adjustable in 0.5 watt increments. VOLTAGE AND WATTAGE MEMORY: The iTaste MVP 3.0 has a memory feature that will "remember" the last voltage and wattage settings when it is turned off and will retain that setting when the mod is turned back on. PORTABLE POWER SOURCE: The iTaste MVP 3.0 has the capability to charge your small electronics such as cellphones and tablets. Simply plug the larger end of the USB cable into the iTaste MVP 3.0 and the smaller micro USB end into the electronic you wish to charge, then power on the iTaste MVP 3.0. DO NOT charge more than one device at once or you may cause damage. CHARGING: Plug the USB into a USB port and the micro USB into the iTaste MVP 3.0 and charge for no more than 5 hours at a time to ensure that you do not cause damage to the mod. REMEMBER: NEVER LEAVE YOUR ELECTRONICS UNATTENDED WHILE CHARGING.